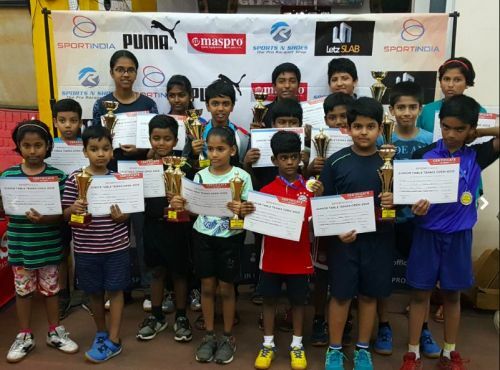 SportIndia's first event for the year has been successfully concluded, their Junior Table Tennis Open for the month of January for Boys and Girls category under - 8,10,13 and 15. The event had been scheduled on 5th and 6th of Jan at SDAT AKG Table Tennis development Centre, Periyamet, Chennai. Many budding sports enthusiast had participated in this event and had won in several categories. Around 200 students participated with more than 50 players enrolled in each category and around 20 sporting academies were involved. The tournament had a good reach with active and vibrant participants. The matches were followed by a league format in order to provide match exposure to the kids and to exhibit the player's training practice. Round Robin - 1 Set & 21 Points, Knockout - 1 set & 21 points, Semifinals & Final - Best of 3 Games - 11 Points each. SportIndia with immense pleasure and gratitude would like to thank all the participants, parents, coaches and all the sports enthusiast for making this table tennis event successful. Let's join hands with them for all other sporting activities in the upcoming months. Lets Play and Happy Sporting.